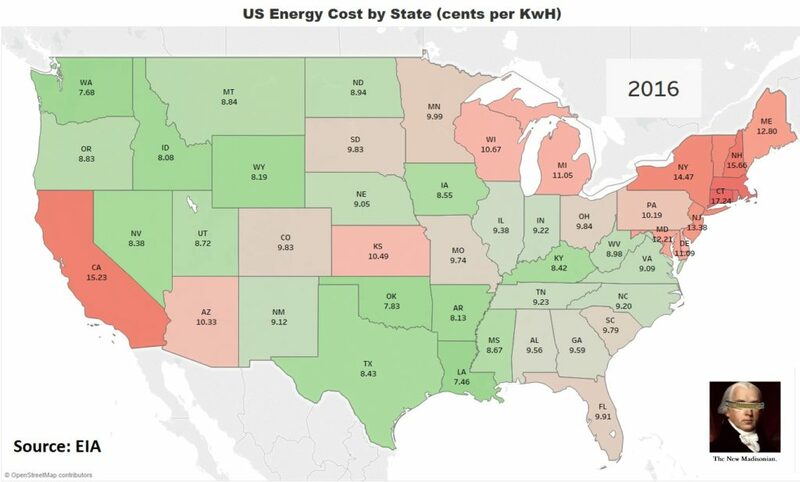 In this edition of The New Madisonian, we take a look at energy costs by state in the US. We start from 2001 and work our way to 2016. Let’s start out in 2001. In that year, Louisiana was among the top half of most expensive states for energy, ranked #32 nationally. 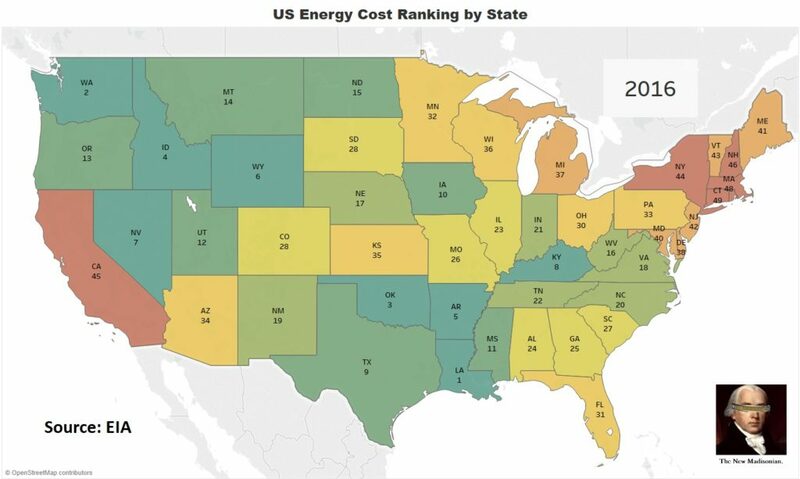 Kentucky had the lowest energy costs, followed by Wyoming, Idaho, West Virginia, and Utah. The theme from 2001 would appear to be that the closer your state is to major coal mining operations, the lower your energy costs. By 2016, the national environment had shifted dramatically. 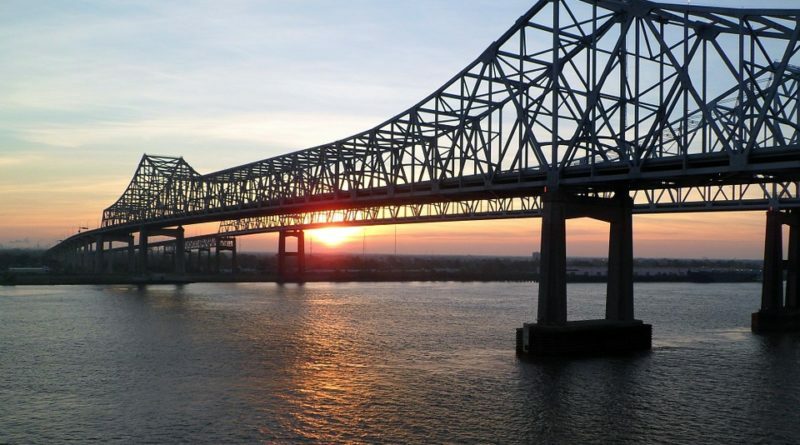 Louisiana, a higher-cost state in 2001, had become the low-cost energy king due to cheap natural gas. Texas, Arkansas, Oklahoma, and Mississippi also transformed from middle-of-the-road and high-cost energy states into some of the best locations for utility bills. Nevada has also shot up the charts going from the #39 ranked state on energy costs in 2001 all the way to #7 in 2016. States that have gone in the opposite direction include Maryland (#28 in 2001, #40 in 2016) and Wisconsin (#18 in 2001, #37 in 2016). When adjusted for inflation, energy costs have risen in most of the United States over the past decade and a half. Energy cost have fallen in 10 states total (NV, LA, OK, AR, NM, FL, PA, NY, VT, and ME), and have risen significantly in a few as well (KY, WY, WV, MD, CT, IN, AL, SC, OR, UT, NE, ND, MN, WI, CO). The biggest loser of the past decade has been Kentucky, which now sees prices that are 47% higher in real terms likely due to higher costs associated with coal extraction. However, this may be a bit misleading, as Kentucky is still the 8th best state in terms of costs. Maryland and Connecticut, on the other hand, started off as high-cost states in 2001, and have become even higher cost since then. 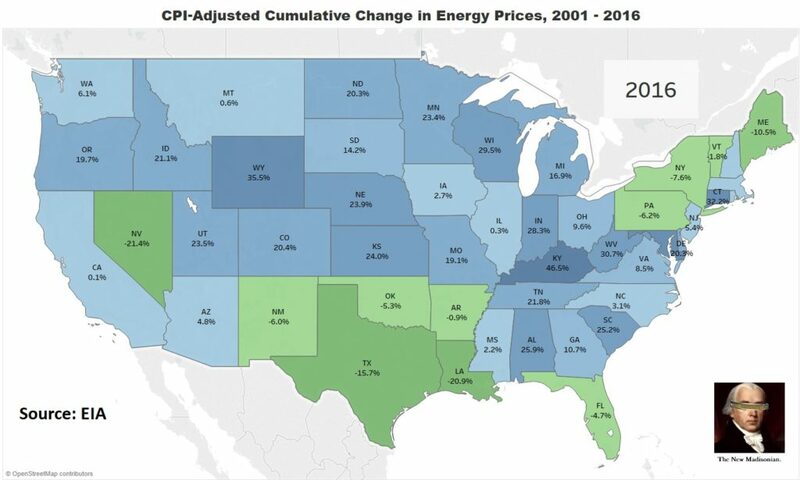 Connecticut now has the highest energy prices in the continental US and has seen a 32% real price increase since 2001. Maryland has seen its costs rise an even steeper 37% in real terms, falling from #28 to #40 in our rankings. Overall, the Northeast is still, by far, the most expensive area of the US for energy usage. All of New England, New York, and New Jersey are in the Top 10 for high cost states in the continental US. They are joined by California, which is an outlier in the Western US where energy costs are generally quite affordable. Washington state (#2), Idaho (#4), Wyoming (#6), Nevada (#7) , and Utah (#12) are all in the top quarter of lowest cost states for energy. Oregon (#13) and Montana (#14) trail not that far behind. The South is a mixed-bag with the gas producing states and nearby neighbors being among the lowest cost (OK, TX, LA, AR, MS), while the rest of the South (TN, GA, AL, SC, NC, FL) tends to be middle of the road. 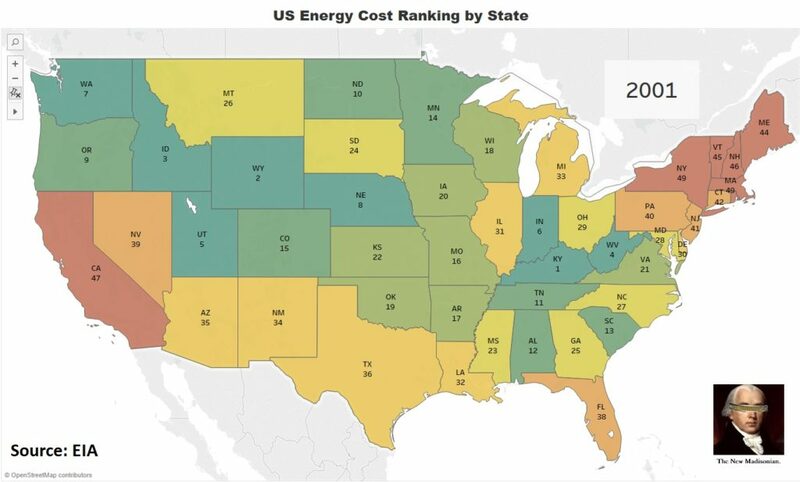 Tennessee and Alabama used to be among the lower cost energy states but have both seen real cost increases over 20% over the past 15 years, moving them down the list. If you’re a heavy energy consumer, your best bets would be to either locate in the South-Central US (TX and neighbors) or the Pacific Northwest / Mountain West region. And keep far, far away from places like the Northeast and California. ← Unredeemed Gift Cards: Retail Gold!